Annie Ruefle has been a school librarian since 1986 in various schools in Columbus, Ohio, and is currently the Lower School librarian at Columbus School for Girls. Annie's literacy programming includes hands-on projects involving reading, research and art projects. A frequent presenter at local, state and national library conferences, she is the author of "Creating a Culture of Literacy," a programming guide for librarians, as well as several articles on library issues. 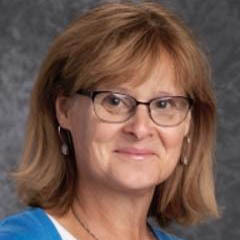 Awards include a 2008 Teacher of the Year by the National Catholic Educational Association and a 1999 award presented by the Ohio State University for outstanding librarian/reading teacher in the state of Ohio. She has been a guest lecturer at Kent State’s School of Library and Information Services Association and is a member of the American Library Association, the American Association of School Librarians and the Ohio Educational Library Media Association.